Grace Saunders, thirty-one, met her husband Jamie in high school. They married young, left their native Midwest, and settled happily in Portland, Oregon. Shortly after their move, Jamie was injured in a hiking accident. For almost two years, Grace’s life has consisted of her work as an administrative assistant for a commercial realty company and visits to her husband whose brain injury has left him in a vegetative state. Grace finds her job unsatisfying, but the health insurance keeps her husband in a facility where he receives excellent care. Neither widow nor wife in anything but name, Grace is grieving for the husband she loved and the life she lost—and feeling guilty for wanting more than her life has become. Nan Wilja, sixty-two, was widowed twenty years ago when her husband was killed in a plane crash. Nan regretted that her time with her beloved Jim was cut short, but she took comfort in her four biological children, who were twelve, ten, eight, and five at the time of their father’s death, and in the three children she adopted. With her children all adults, she enjoys their annual summer reunions complete with eight grandchildren. Her life is filled with gardening, needlecraft, and the nurturing that she feels called to give to bereaved humans and animals. Rainbow Gate, a rescue organization for dogs whose owners have died, is a particular interest. But her lost daughter, a drug addict living on the streets, is a constant source of grief. Grace and Monica meet Nan and her therapy dog Blixen when the two younger women drop out of a grief support group composed of elderly widows. The three women are different ages with different life experiences, but they bond and form their own support group. The friendship they share sustains them through tumultuous times of grief, growth, and second chances at love. 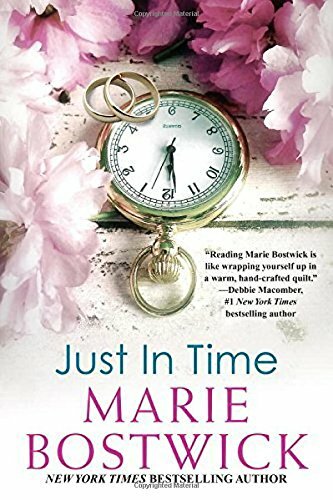 Just in Time is a heartwarming women’s fiction novel about grief, friendship, and the unexpected turns life takes. Bostwick has a masterly touch at creating female characters who are likable, flawed, and real. She does it again with Grace, Monica, and Nan. Readers will find these women and their stories engaging. Romance readers will be pleased that while the friendship of the three women and their journeys, individual and intertwined, is the heart of the book, each woman’s story has a romantic element with a conclusion that should leave the most HEA-addicted reader smiling. Bostwick is a dependably consistent writer, and Just in Time offers the kind of believable, life-affirming story that has made her a favorite with readers. Sound like a good story. Oooh, this looks really good. This sounds like such a wonderful read. The close, supportive relationships that can mean so much to women are often overlooked for concentration on the romance element. These relationships help women through all stages of their lives. They help each other through the rough spots and celebrate the happy events. Thanks, Janga! I've always enjoyed Marie Bostwick's books. I need to add this one to my list. Wonderful review. I can see this is going to take us on an emotional roller coaster ride. This books sounds amazing and a must read. Adding to my endless tbr.